In remote times, the early man discovered in the cavern a place where to find cover before the rain and the cold. This revelation, which allowed him to support the inclemencies of the climate in a space of relative comfort, is labelled by Umberto Eco as the birth of the architecture1. 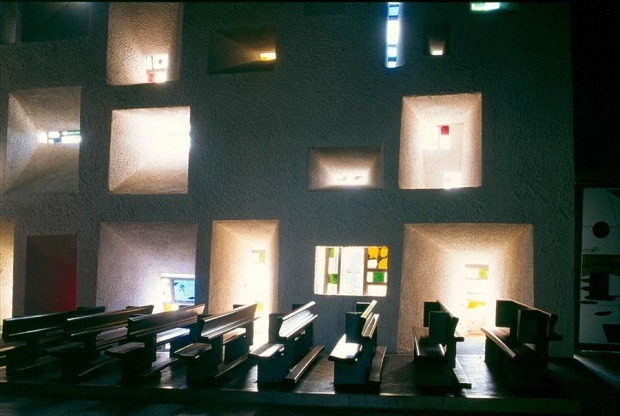 Thousands of years later, the pristine image narrated by Echo can apply to him as a sign of profuse analogy for graficar the essential characteristics of the interior space of Ronchamp’s Chapel, the poetical maxim of Le Corbusier. 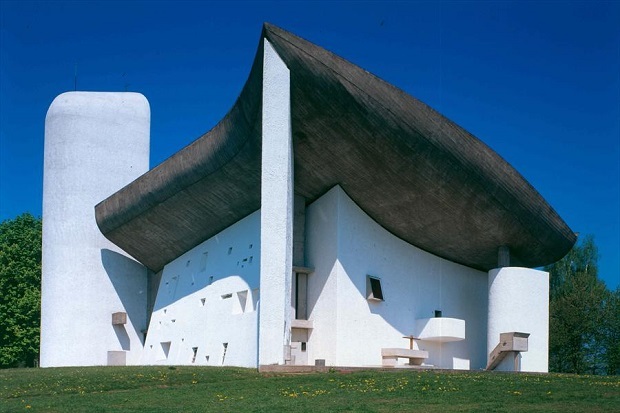 Ronchamp is an erudite exercise that parts with any precedent tipológico to look for the thresholds of the architecture. His three-dimensional walls plan the parallel one with the cavern2, established as forms of the nature shaped by the man in the top of a hill. The tensions and ambiguities of his geometry construct his figure as the continuous one of concavities and convexities that allow to protect a space of dream. The walls form autonomous entities that associate to enclose the space with the slightly orthodox profile of the cover, defined of an inverse way to the curvature of the area and to the natural runoff of the water. The principal door pivotando on the axis of the vain one, anticipates the event doing that the access to the chapel does not turn out to be a not transcendental fact. In the south side, the wall is a carrier of a dramatized thickness. His surface penetrated irregularly allows to lead in different directions the faeces of natural light that travel impregnated from the color of the vitrales, splashing the space in an attractive and changeable spectacle with to pass of the day. 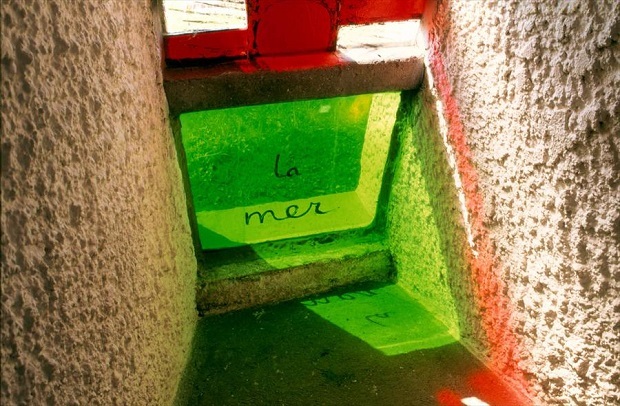 Accentuating these tensions, the cover moves back from the walls to allow the revenue of the solar light, which to his step wraps the cement curvature consumando a maneuver of premeditated seduction. The absence of edges establishes an indefinite continuity of the walls, always subdued by faeces of light from different directions that prevent the precise definition of the limits. In this event, the ruggedness of the wall constructs the necessary complicity to affect with the different intensities of shades. 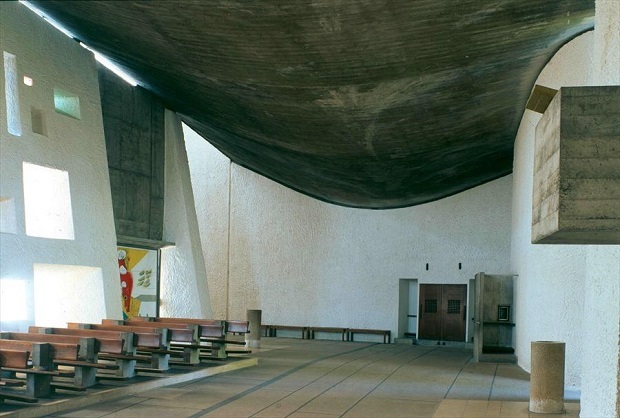 Le Corbusier amalgamates the stone and the light of an innocent way, with so much impetus that turns out to be impossible to conceive an element without other one. The design brings together the ideal artistic one of fusing the architecture, the painting and the sculpture since rarely it was reached in other works of the modern movement. 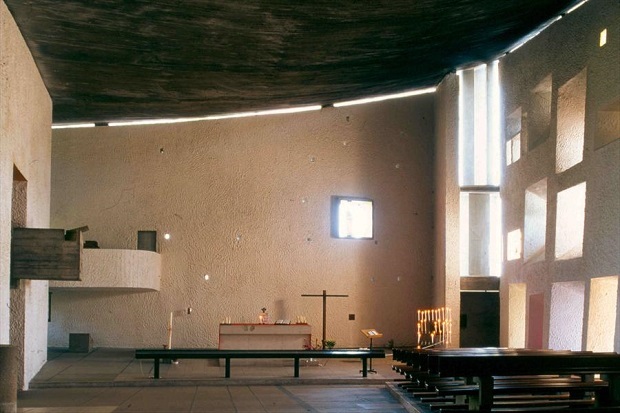 Ronchamp’s interior composes a genuine and homogeneous statement. 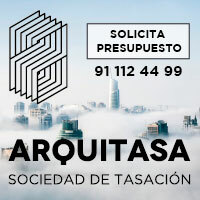 The invariable character of a building caught by the sorcery of the light as result of an exercise of architecture put to the service of the poetry, or of the poetry put to the service of the architecture.